After trading flat for most of the week, stocks broadly sank Friday on fears of a future rate hike. For the week, the S&P 500 lost 2.39%, the Dow fell 2.20%, the NASDAQ dropped 2.36%, and the MSCI EAFE lost 0.16%. Monetary policy was at the forefront of investors' minds last week as they continue to calculate the odds of an interest rate increase ahead of the September Federal Reserve's Open Market Committee (FOMC) meeting. The European Central Bank (ECB) declined to increase its stimulus program, voting to stand pat on interest rates and current bond-buying activity. The decision wasn't a total surprise as the Eurozone economy has proved resilient after Britain voted to exit the EU. However, the ECB did confirm that it will consider further quantitative easing in 2017 if conditions worsen. No exit date for Britain has been announced, though the new prime minister has indicated it will not begin before next year. On our side of the Atlantic, surprise comments by a voting member of the Fed increased speculation that a rate hike may come this month. When markets are quiet, even rumors can be enough to spark a selloff. In previous weeks, Fed officials have ramped up hawkish rhetoric, suggesting sentiment that the Fed is moving toward a rate hike. Even reliably dovish officials, who have historically maintained a cautious stance, are showing interest in raising rates again. We have now entered the quiet period before the FOMC meets September 20th, meaning we won't get more statements from Fed officials before they vote on monetary policy. The information blackout will give investors plenty of spare time to digest previous statements and come to grips with the idea that the Fed is serious about raising rates this year. All the speculation around the Fed's increasing assertiveness about rates had a palpable effect on markets, which may be what the Fed wants to achieve. The chart below shows Wall Street trading probabilities of higher interest rates in coming months. On Thursday, traders put the odds of a September hike at just 18.0%. By the close of trading on Friday, the odds had surged to 24.0%. 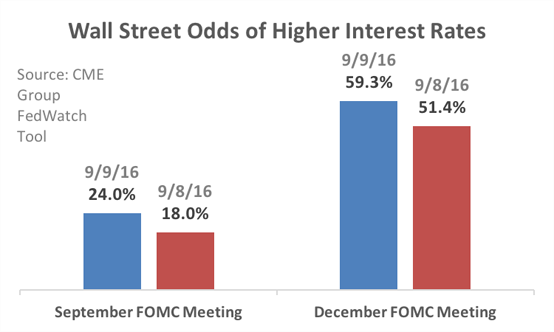 The odds of a December hike had been about even; now, traders seem to believe the Fed will raise rates again this year. Is last week's pullback a minor blip? We can't know for certain, but investors should prepare for a bumpy ride this fall. The week ahead is packed with economic data, including critical reports on business inventories. Positive data could contrarily cause further selling if investors believe it could spur the Fed to act. Negative data might likewise be greeted with cheers. As we move to a Fed vote and uncertainty around the November election peaks, markets are likely to remain volatile and perhaps even move into a more prolonged sell-off. It's too soon to know. As always, we'll keep you informed. Fed Beige Book shows wage gains restricted to skilled workers. A key report released by the Federal Reserve showed that the economy grew modestly in July and August. However, data shows that most wage gains occurred only in skilled jobs where employers are struggling to find qualified workers. Weekly jobless claims drop. The number of Americans filing new claims for unemployment benefits fell unexpectedly last week, marking the 79th straight week that claims remained below the key 300,000 level associated with a healthy labor market. Monthly job openings increased in July. The number of available jobs, a data point closely watched by Federal Reserve economists, increased by 3.9% In addition, the hiring rate rose by 3.6%, pointing to a strong labor market. Gas prices slide after summer. The summer driving season is over and falling gas prices might slip further this winter. Americans enjoyed the cheapest summer gas since 2004, and economists hope the "gas dividend" will boost spending this quarter.